Welcome to our website. For those who don't know, that's Pete on the left and Tim on the right! 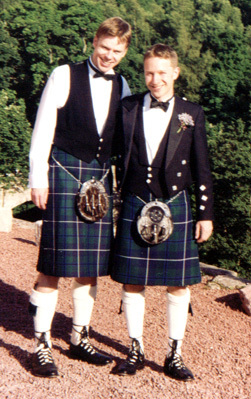 This was taken at our friends Matt & Wakako's wedding (2000). It's the one and only time that Tim has worn a kilt! There are now pictures of our civil partnership ceremony and celebrations in the gallery. As usual, comments are welcome! Amazing - we actually added more photos to the gallery - our holiday in Corfu and Italy in May. Check out the gallery.